On October 22 (Mon), City Mayor Aleksas Varna and three other delegates visited TUT from Panevėžys, Lithuania. Panevėžys is a city located in central Lithuania, with a population of 100,000 people. 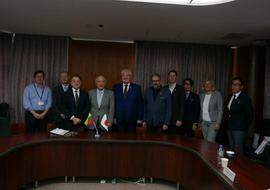 The city of Panevėžys also plays home to a robotics facility from the Kaunas Institute of Technology, and with an interest in the research relating to robotics carried out at our university, the group made their way to Toyohashi to visit both the city and the university. The group were given a tour of the Center for Human-Robot Symbiosis Research, and observed enthusiastically while learning about how robots could be used in real life, and also visited other areas related to robotics research. 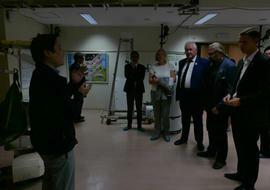 After the facility tour, the group was given an explanation of the university by University President Onishi, Director and Vice President Terashima, Vice President Matsuda, and Professor Hozumi. 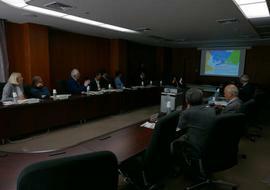 Following on from this, an active exchange of opinions and ideas took place on the possibility of a future partnership with the University, with a focus on exchanges within the field of robotics.